Here is a list of available Lineage OS 14.1 for Xiaomi phones and tablets. What is LineageOS?? I don’t know if you are aware of the fact that CyanogenMod is now LineageOS and there will be no development happen further on CyanogenMod from here. CyanogenMod 14.1 is the last development and further development from here on will happen on the CyanogenMod codebase but in the name of Lineage OS. In addition to this Xiaomi LineageOS 14.1 ROMs list, we also have a complete list of all available LineageOS 14.1 ROMs, LineageOS 13 ROMs. Although it’s too early to think of LineageOS 15 ROM based on Android O, but still we already have a Android O based Lineage OS 15 ROMs. Earlier to Lineage OS, there was this unofficial CM14.1 (CyanogenMod 14.1) ROMs and OFFICIAL CyanogenMod 14.1 (CM14.1) ROMs available but after CyanogenMod website is taken down, the OFFICIAL NIGHTLY builds will not be accessible at all. 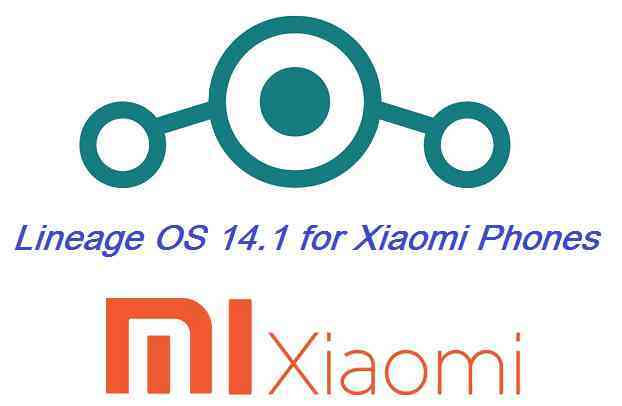 This page is dedicated to maintain the available LineageOS 14.1 ROMs for all Xiaomi phones and tablets ONLY. There will be two such lists updated (as below) containing UNOFFICIAL Lineage OS 14.1 and OFFICIAL list of LineageOS 14.1 for available Xiaomi phones. Just stay tuned to this post if you want the latest LineageOS 14.1 ROM for your Xiaomi phone. It is not guaranteed that your device will get an update of Lineage OS but you can hope for the best always. Lineage OS 14.1 is not available for all of the Xiaomi phones and out of the available builds, we may not have added all of the Xiaomi phones in the list. If you find your device missing, then just login and place a request and I will try to search and bring it for you..
Can you build ROM for Xiaomi redmi note 5a (ugg) 4/64 GB? Thanks..
Can u add support for XiaoMi RedMi Note 3 (Hennessy)? Any chance Lineage OS will be available on the Xiaomi Mi 5X? Thanks! Hello, could you please add Lineage 14.1 to mi pad 2 latte? Thanks so much for all the great job you guys have been doing for all the users. Could you create a Lineage OS 14.1 rom for Xiaomi 4X (4GB ram, 64GB rom) please? Could you please bring Lineage OS 14.1 for Xiaomi X4? Here is the correct model: Xiaomi Redmi 4X (ROM32Gb/RAM3Gb)? Hey PWR Pro, here is the LineageOS 14.1 for Redmi 4x. MI 4S (Aero). Any chances for this item? Any chance to get Lineage for Mi2s ? Yesterday I found a new Unofficial version: lineage-14.1-20170513-UNOFFICIAL-virgo. I’m looking for a ROM without MIUI for my Redmi 4 Prime 3Gb/32Gb (not “NOTE”). Is this ROM available for it? Any chance for Redmi 4 Prime with SnapDragon? hi, i was wondering if or why there isn’t os 14.1 or lower for mi rednote 2? Hi telehab, Do you mean the Redmi Note 2 ?? I’m looking for lineage os 14.1 rom for Xiaomi Mi Note (virgo). I found one inofficial 20170324, but sensors of Mi Note didn’t work, so it was not good in use. I did not find any other Lineage OS for the Mi NOTE right at this moment. Will keep you posted as soon as I get one.